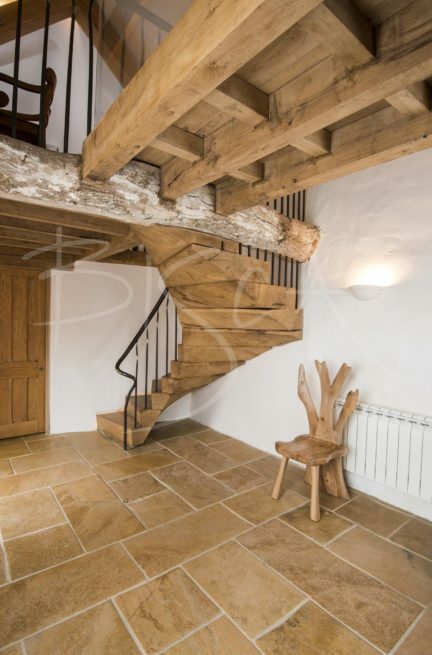 A rustic staircase in a converted listed Devon Shippon (cowshed) where access to the upper floor had long since deteriorated. 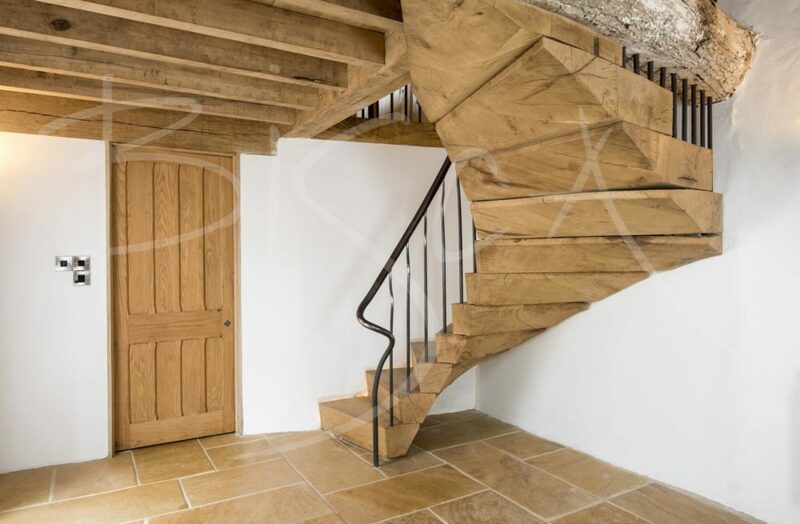 Our clients wanted a functional and sculptural staircase yet worried it may detract from the building’s humble beginnings. 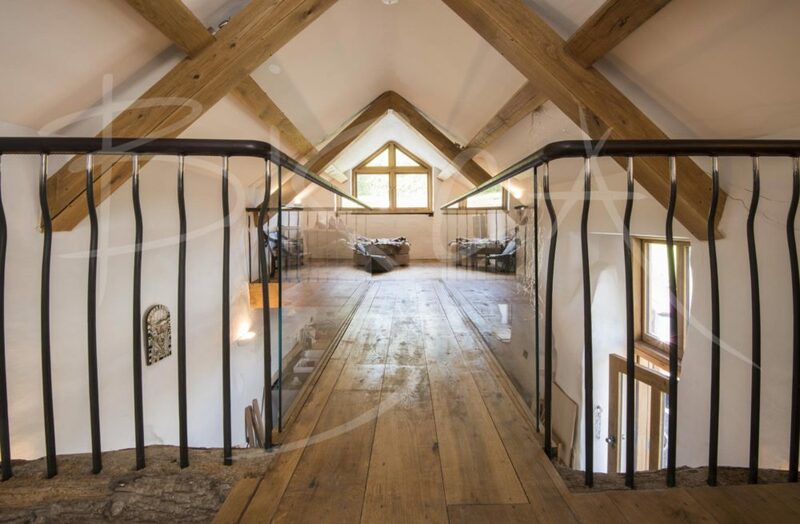 Our design takes inspiration from the natural curve of existing timber beams and the randomness of wall surfaces, and features natural materials available to the people who built it. Traditional processes built a staircase worthy of the original architecture. Huge treads, hand carved from green oak with a chain-saw, stack forming a sculptural soffit to the underside. Green oak is not for the faint hearted. 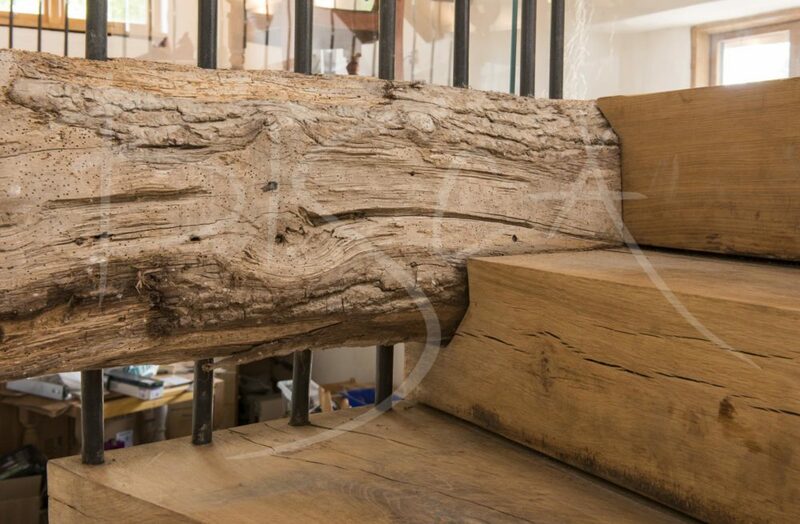 As it dries, it cracks, twists, splits and, within a few years, takes on the same patina as the existing timber. In spite of the condition of the walls we managed to cantilever the upper part of the flight. Extreme care at design stage ensured seamless interfaces between old and new. Blacksmith forged tapered uprights rise through the inside of the staircase. A stainless-steel feature newel splices into a leather handrail. Uprights continuing onto the landing meet with a low iron glass balustrade on the bridge. The glass balustrade allows light to flow throughout the building from the openings below. The returns of the bridge balustrade have the same forged uprights as the staircase. 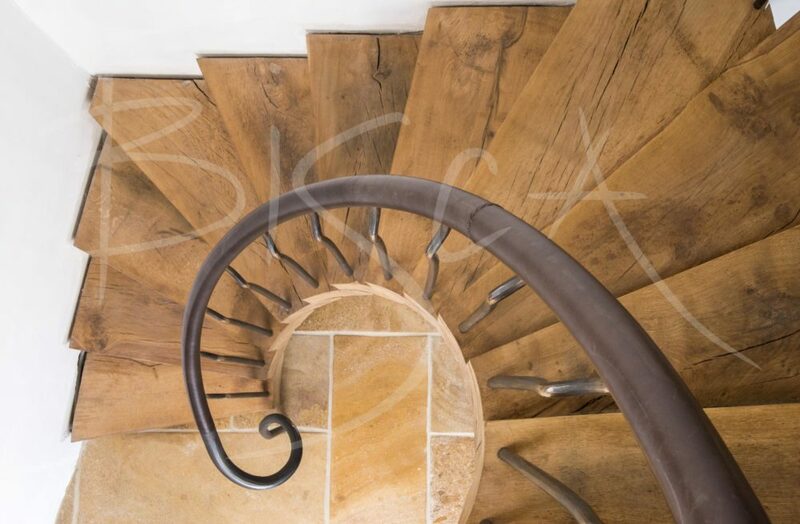 This rustic staircase has gained a place in the Bisca Classics hall of fame. It won both the Build It Award – Best Joinery Product, and Northern Design Award for Best Product in 2015. For more info on this staircase please quote 3826.